Jim Cook is a 1983 graduate of St. Pius X High School. He began coaching at SPX in 1991 and was hired as a full-time teacher in 1992, teaching Government. Coach Cook is entering his 22nd year as the St. Pius X Athletic Director. St. Pius X Athletic Department A program rich in history and tradition. 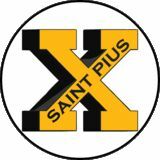 Fall Wrap Up St. Pius X had an incredible 2018 fall season with nearly every sport finishing off the season with a District Championship and half entering the State Chanpionships as the No. 1 seed. Congratulations to all of our athletes and coaches and a special thank you to all of our parents and fans for continuing to keep the tradition of St. Pius X Athletics thriving! The boys won their third straight district championship, led by first year Junior, Caleb Baca’s 2nd place finish. Right behind him was Sophomore Aidan Trujillo in 3rd. Joining these two with all-district honors were Junior Matthew Buerschen (8th), Sophomore Jonah Arnett (9th) and Senior Santiago Monotoya (10th). The boys led by Baca’s 19th place finish, placed 10th at the state meet. Coach Turcotte was named Boys XC District Coach of the Year. The girls placed 2nd at District, led by Freshman Gracie Baca’s 4th place finish. Senior Mya Martinez-Metzgar was right behind in 5th place to join in on All-District honors. Martinez-Metzgar led the girls team to 10th place at state with a 27th place finish. The girls state team had three freshmen, a sophomore and one senior. The St. Pius X Cheerleaders competed throughout the fall season and plan to have a heavy competition season in the winter. They placed 6th at the Cleveland Challenge in November. The JV Cheer Team took 1st in the Rio Rancho High School Spirit Rally on December 1st. The Varsity Cheerleaders will be performing at National Competition in Dallas, TX on Jan 26th, The Heart of Gold in Los Lunas, NM on Feb 16th and The Heart of the Tiger on March 9 in Aztec, NM. The SPX Dorados Dance Team is currently in the midst of competition season. In November, the team competed at the Cleveland Challenge and was awarded 3rd place in Varsity Pom. In December, the Dorados competed at the Rio Rancho High School Spirit Rally, placing 4th. Wrapping up the fall season, they placed 4th at the APS Metro Spirit Competition at Valley High School. Over Christmas break, nine Dorados, who were selected as Universal Dance Association All-Americans, traveled to Rome, Italy to dance at the New Yearâ&#x20AC;&#x2122;s Day Parade. Currently, the team is in full gear preparing for their trip to the National Dance Team Competition (NDTC) at Walt Disneyworld in Orlando Florida. They will compete February 1st- 3rd. The season will culminate in March with the NMAA State Dance Competition March 29â&#x20AC;&#x201C;30, 2019. The Golden Celebration of Sartan Football The first Sartan football team returns to the field 50 years later. guys who are still proud after 50 years. All of our wives said that we acted like little kids the day of the game. I know I had goosebumps for a couple of days, both before and after.” Since the inaugural first season, Sartan football has become one of the most consistent programs in the state, holding 24 District Championships, two State Runner Up Titles and three State Championships. Coach Daryl Wells, a California native, graduated from Homestead High School where he began his swim career as a MVP in both swimming and water polo. He then went on to serve 6 years in the United States Air Force and completed his education at Cal Poly Architecture School and Virginia Tech. Coach Wells holds many accolades, including New Mexico High School Water Polo Coach of the Year, New Mexico Swimming Coach of the Year and New Mexico Swimming Volunteer of the Year for his work with the New Mexico Swimming Zones All-Star Team. He also serves as the New Mexico Swimming Age Group Chair and has been a club swim coach for the last 7 years. Several of his swimmers have ranked in the top 5 in the nation in multiple events, including two swimmers ranked at #1 in the nation for their age group and event. He is a National Level Swimmer and has coached all levels of swimming, all the way up to the National Level. who holds several New Mexico swimming age group records and swam collegiately at UNM, placing 3rd at conference finals. In addition to coaching at St. Pius X, Marissa continues to compete at State and Regional Levels while pursuing her degree. Coach Damian Segura is a 1993 graduate of St. Michael’s High School in Santa Fe, NM and a 1998 graduate of St. Mary’s University in San Antonio, TX with a BS in Industrial Engineering. Coach Segura began his coaching career at St. Pius X High School as a volunteer assistant coach for the freshman team, hired by Head Varsity Coach Todd Resch in 1999. After graduating from college, Coach Segura wanted to take a hiatus before beginning graduate school and felt that coaching high school basketball would be a good opportunity. He coached the boys freshman team three of his four years as an assistant coach before being offered the head coaching position in the spring of 2003. In his first year coaching varsity, Coach Segura was blessed to have Coach Frank Dooley on staff as the varsity assistant. Coach Segura recalls about working with Coach Dooley, “Coach Dooley is a multiple state championship coach and is in the NMAA Hall of Honor, and as successful as he was a coach, he is a better person. He was invaluable my first season and I still consider him a mentor to this day.” After two decades of coaching basketball at SPX, Coach Segura remains a legend in his own right. The current staff is a reflection of the love of basketball that he has engrained in his players. Segura is assisted by Ryan Meyers ’09 (Varsity), Micah Sanchez ’13 (JV), Nathan Petersen ’15 (JV and C-Team) and Taylor Whitener ’13 (C-Team), all SPX alumni and former players of Coach Segura. Above: St. Pius X Sartans take 2nd place at the Stu Clark Tournament in Las Vegas, NM. Left: The St. Pius X Sartans battle the Pecos Panthers in the 65th Annual Stu Clark Tournament. The Panthers defeated the Sartans 66-44 in the final game. focus on one play at a time. losing takes care of itself. dedication over the last 19 years, “I’m not sure I would have survived all of those years without his expertise, trust and friendship. Coaching basketball has been very rewarding, but the friendships that developed over the course of my career are the greatest benefits. I love that two former players are on my current staff, Robyn Dow ’98 (JV) and Emily Dieterichs ’15 (C Team). This has been a dream job, and I’ve been living my dream. 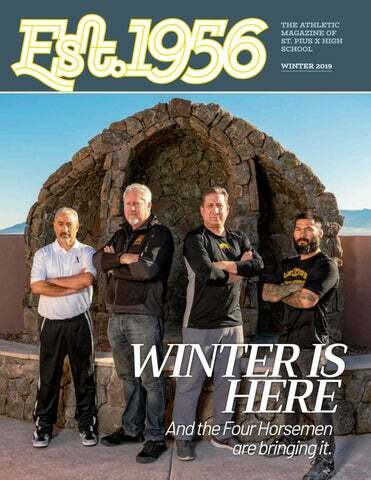 It’s been a great ride, and I’m so proud to be the head coach of The St. Pius X Girls Basketball Program.” 2019 Girls Varsity Basketball Team, Assistant Coach Dereck Atencio, Head Coach Phil Griego and Assistant Coach Kevin Hillsey. 10 YEARS AS A COACH 2 YEARS AS A HEAD COACH AT SPX SPX RECORD: 10TH OVERALL IN IN 1ST YEAR, 3 STATE RUNNER UP WRESTLERS Coach Damacio Page, former two time All American and Junior College National and New Mexico State Champion Wrestler, is in his second year coaching at St. Pius X High School. Coach Page coached high school wrestling at West Mesa and Sandia High Schools, before coming to SPX in 2017. He is a 2001 graduate of West Mesa, where he won the New Mexico State Championship his senior year with an undefeated record. He was also a High School All American in 2001. He later attended Cerritos Junior College in Norwalk, CA where he received national recognition. After college, Coach Page spent the last 14 years competing in the WEC, the UFC and K-1 Dream. He held the WEC World Title in 2008 and the Legacy World Title in 2014; his overall record is 2010. Coach Page believes that by challenging young men in a sport like wrestling, they are put on a path to success. He is hoping to create a wrestling dynasty at St. Pius X, “We’re going to be tough. St. Pius X is not a small school. We are going to make our mark in our district and in the state.” Coach Page is assisted by Lenny Lovato. The 2019 SPX Wrestling Team strategizes before a meet with Coach Page and Coach Lovato. 7120 Wyoming NE Ste. 7B Albuquerque, New Mexico 87109 P:(505)346-0533 F:(505)346-0532 Mon-Fri: 9am-7pm, Sat: 9am-5pm, Sun: Closed www.samsregentrx.com Dedicated to fast, friendly service. Delivery and compounding available. Independently owned and operated since 1989. The Arnett family proudly supports all St. Pius X student athletes. Best wishes for a blessed 2018/2019 season, Jason ‘19 and Jonah ‘21! “Sartan Saturdays” get 10% off over the counter merchandise. Just mention you are part of the Sartan community. THANK YOU to all of our parents for providing photos for the Winter Edition of Est. 1956. We could not publish this magazine without all of your support! The athletics magazine of St. Pius X High School.